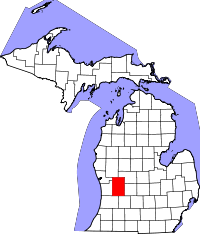 Kent County, one of the top 5 most populated counties in Michigan, has a large number of genealogical resources available to the public, in addition to the County Clerk's office which has a research area open to the public on Tuesdays, Wednesdays, and Thursdays from 8:00AM until 5:00PM. Birth and death records are both available with dates starting in 1867 to the present, although birth records more recent than 110 years are restricted from the general public. Marriage records are listed from 1845 to the present, and other records, such as divorce or adoptions are available via other departments, such as the Kent County Circuit Court Clerk (616-632-5480). Two people are allowed within the research area at one time for a maximum of two hours if others are waiting. Records are also available by mail via the County's online ordering system. A convenience charge is added to the total fee for records ordered online.